I look forward to welcoming you to our Award Winning Hotel, if I can be of any assistance please contact me at either adriette.meyer@accor.com or 0400 661 914. Ibis Mackay features ibis Sweet Beds in every room, complimenary car parking, complimentary WIFI, a fully equipped gymnasium and modern Tavern. TurBARlence offers gastro pub food and craft beverage offerings with a great outdoor beer garden. Located beside the airport terminal and with double glazing and core filled block walls the rooms are very quiet. Flight information screens in the hotel, only a 4 minute walk you will be at your gate. 20 meter walk to the airport, pick up and drop off of your hire car is very convenient. TurBARlence Tavern open for Al a Carte breakfast Monday to Friday and from 5am and 6am Saturday and Sunday. All day dining runs between 10am - 9pm. With modern furnishings and upbeat atmosphere TurBARlence is a place you will want to spend time. Adjoining the hotel is The Tavern, which offers alfresco dining, modern bistro fare, wines, cocktails and gaming facilities. It is very rare for me to fill one of these surveys, but my experience at the Mackay Airport Ibis on the 18th of April I felt was worth sharing. I had stayed at the property the night before and checked out at 5.00am to catch a flight to Brisbane to join an international flight. Unfortunately, the aircraft suffered a failure and I was rebooked for the following day. Having nowhere to stay, I walked back across the road (it was almost 10.00am by this stage) and went to reception. Maggie, behind the desk, asked how my day was going. When I explained my flight had been cancelled, and ask if she had a room available, she went out of her way to get me booked into a room on the 7th floor and made sure I could go straight into it. Her wonderful service cheered me up no end and lead to an enjoyable stay (with two excellent meals to boot and welcome drinks). We stayed overnight for persinal reasons. Chose the Ibis as it was the only accor hotel in town. We are glad we did. We knew it was close to the airport but obilivious how close. What a place to stay if you were flying. We weren't but were not adversly affected at all. Service was fantastic and staff members friendly and helpful . Food good and plentiful, though my steak more rare than medium/rare. Rooms great with very comfortable beds. Bathroom was a bit tricky if two using it at the same time. Would definately stay again if coming to Mackay. I booked the Ibis Mackay for an overnight stay, as my flight left early morning. The staff is super friendly, the room new, spotlessly clean and most importantly, the bed was super comfortable. The location is literally steps (1 minute walk) from the airport terminal, and adjacent to the rental car return. The morning I left, I walked to the airport, dropped my checked bag, checked in, then walked back the the Ibis for breakfast. Walked back in for my flight when it was time, and loved relaxing in my room instead of a hard airport chair during the wait time. The Ibis gets a big 5 stars from me! 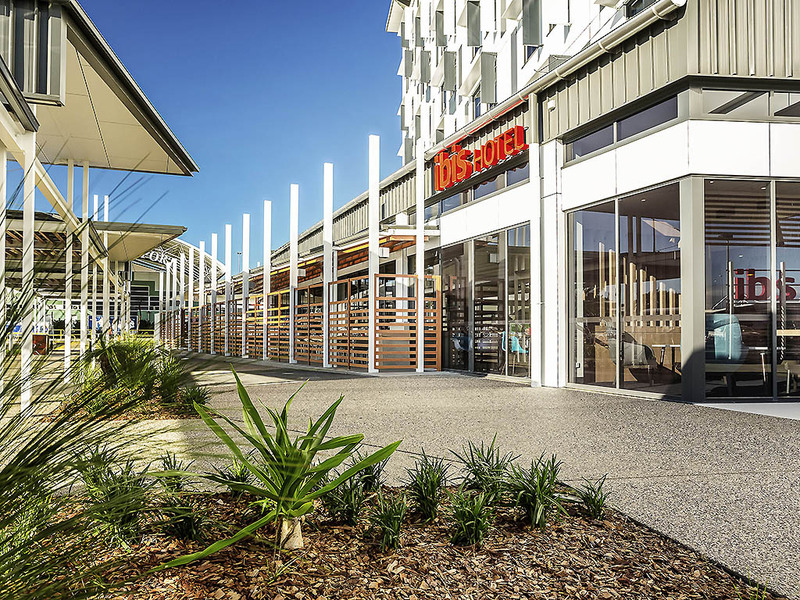 I Like Ibis Mackay, it has been always great for food and now for accommodation. Better than most hotel/motels we have stayed in. Friendly and efficient checkin. Although room was small very comfortable and has everything you need. The room was clean, service was excellent and food was also delicious. The check in and out was efficient and the staff friendly without being over-friendly (it seems genuine). During my last stay the food was not great and I gave a low score for that. It seems there was a step change in the kitchen as both my dinner and breakfast was great. Have been staying here for Work since late last year & it is the ideal Hotel for an overnight stay. Great stay for the night! Short stay (1 night) for business but conveniently located and had what I needed. I will definitely be staying again, and will recommend the hotel to any other colleges travelling to Mackay. First stay at this IBIS and was very impressed by staff and service levels,location was good for us, and an in house restaurant was an added bonus. Room rate is very attractive considering this is a near new hotel,Compliments to the management and staff.